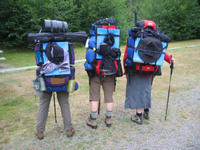 This past August, known to locals appropriately as "Fogust", I set out for seven days backpack loaded with oils, easel and the necessities for the NW coast. 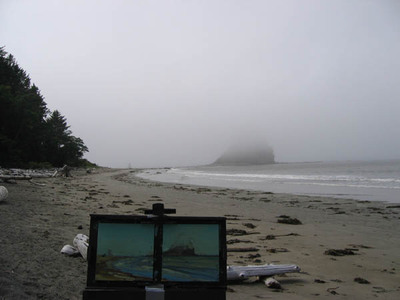 Joining me on this heavenly week of nothing but plein air painting were four other die-hard artists--all hauling painting AND tenting gear out to Ozette. Cape Alava (at Ozette) is the furthest NW corner of the contiguous USA. It's also a beautiful place on our planet--sea stacks, sea otters, bear, bald eagles, and various other land and water creatures all around. A great place to paint--fog or not--and it was nothing but fog every day except for one that was perfectly sunny and warm--oh well. Atmosphere paintings are a good challenge. And we all ended up liking our "fogust" paintings, the making of them and many of the results, better than the lovely sun lit ones! 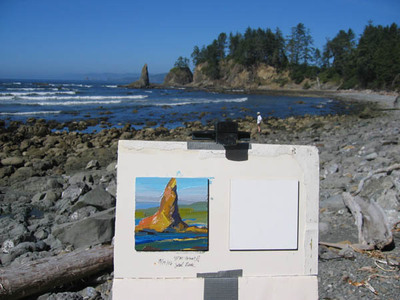 Please visit my PHOTO ALBUM: "2006 Cape Alava Plein Air" for more images--photos and some of my paintings. Once I digitize the rest of my paintings, I'll post them asap. So be sure to come back for more. Thanks for visiting. Click on images for larger versions.